My father raced at Center Raceway back in the early 70's I was about 7 or 8 and looked forward too the races every week. From He and several others including Vic Lonn were from Thompsonville. My Dad didn't do to well, he did get a trophy for going of the end and rolling over. The smell of OFF still makes me think of the old tack we were pretty upset when they closed it down. NEVER THOUGHT I''D SEE SOMETHING ON THE NET ''BOUT THAT OLD TRACK. WAS BEFORE MY TIME BUT I''VE HEARD SOME GREAT STORIES BOUT THAT PLACE. CAL SPANGLER(TRACK OWNER) STILL OWNS THE PROPERTY. SOLD ALOT OF GRAVEL OUTTA THERE. STILL HAS THE OLD SIGN IN THE RAFTERS OF HIS BARN. 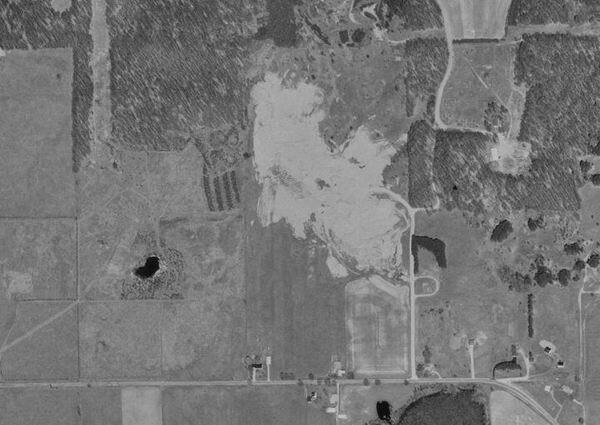 Jason the location in the aerial is on Lemcool Road, take MI 37 south to Hilltop Rd, go west 1 mile, Lemcool is on the right. Larry Price, now there,s a name that rings a bell. He also used to race at Northern Mich Raceway in Elmira Mi. Blue Chevelle #77 for sure, he used to show up and clean house there, really didn,t have a whole lot of competition until the guys from Sault St Marie Canada started comming down. I think Larry was the first car I ever saw there with a Quick Change rear end. the first time I saw him run I couldn,t figure out why the car was making a whinning noise, I didn,t know what a Quick Change was before then, but after he showed up we sure did. I was still sitting in the stands then cause I wasn,t old enough to build a car yet. I raced there later starting in 1980 for a couple yrs till I moved down state, ran a steet stock back then. Wonder if Larry is still around???? Yes he,s the one that made others finally decide they had to get with it or be left behind to lick there wounds. He,s one of the guys that gave me the Idea that I could build a race car and race, others were Frank Shaler, Vasco Zucciatti, Warren Ecker, Randy Sattison ect. This fall I had my Vintage Supermod up there and Frank and Vasco were sitting in the stands. I remember going there to see my dad Jack, Andy Nickerson, Larry Price, Lamar Kreps, and all the others race IN THE DIRT man i miss that place Last I remember its all a gravel pit now. What a shame another track that brought joy is gone, looks like it must have been an airfield too?. It was located off Hilltop road, about half way between M-37 and County Road 633. It was on the North side of the road (Hilltop) there is a gravel pit there now. I dont think there is any of the track left from what Ive heard. I have lived in Grawn myself and have never heard of this racetrack. Could someone possibly tell me where the location of this track is? I would love to find out.